And thanks to our never-say-die volunteers, the Designer Tag Sale* returns on Saturday Nov. 12: all sorts of wonderful home and garden embellishments, just in time to refresh your home for the holidays. Plus, on Thanksgiving weekend, a great shopping opportunity: Sparkling Saturday*, featuring gently-used, unique, and estate costume jewelry for your browsing and gifting pleasure. Starting at $3, these treasures will be here for just one day, Saturday November 26. So gather your Thanksgiving visitors, and come on down! Now, I’m sure you know that pretty darn soon we’ll be asking you to participate in #GivingChallenge16 where your online monetary donation to us will be doubled or even tripled (trebled? I think that’s the historic word!) during the 24-hour window Sept 20-21. But right now, these hot August days are a good time to stay indoors, de-clutter, and donate your underloved but wonderful stuff to help our volunteers raise funds! 1- Have spare or duplicate books and booklets on Sarasota County, regional, or state history? Donate for our NEW pop-up book shop, debuting at Conversations this fall. Drop them off anytime. 2- The Designer Tag Sale comes back Saturday November 12! Home decor items would be wonderful. If you’d give it as a gift, we’d love to have it! Since these donations take up space we don’t have, if you could put them aside to bring in in late October/ early November, that would help so much! 3- Go through your jewelry! We’re having the jewelry sale to end all jewelry sales, Sparkling Saturday, on Saturday November 26 (that’s Thanksgiving Saturday.) Drop off anytime. Guy jewelry too. Yes, even broken jewelry will be helpful. Note: Your donation of costume jewelry gets you a FREE PASS to the sale (a $5 value!) Get a friend to fill a baggie or two with her unworn sparklies, and get free passes for BOTH of you! Inviting friends, neighbors, coworkers and fellow residents to our events and sales is a gift you can give the Historical Society for free, without even de-cluttering! Imagine if we could introduce the Historical Society to two or three times the audience we now have! Summer Heats Up and Members Step Up! Summer Heats Up & our Members Step Up!!! Many thanks to our members who have stepped up this summer to help the Historical Society of Sarasota County. Sue Padden has volunteered to head up the landscaping committee and has planted our herb garden – she comes often to check on “her garden”. She has also elected to do a monthly donation to HSOSC with our pay pal monthly donation key on our website. Please join her in this by checking the button on the website. This is a tremendous help with the funding for the maintenance and upkeep for the two historic gems in Pioneer Park – the Bidwell-Wood House (1882) and the Crocker Memorial Church (1901). Paul Morrisroe volunteered his time and labor to repair the irrigation systems sprinkler heads and connections. This is a great help for the maintenance of the yards. Jon Moore located an antique church bell at the Helm Vault company and coaxed them into making a donation to HSOSC. We thank him and Jack Helm and are looking forward to our “Ring the Bell” party in September (details coming: stay tuned!). Gloria Nepstead has stepped up to replace Margret Bering as our volunteer plant lady taking care of the flower boxes on the front porch of both the church and the house. We are very excited to have our historic Crocker Memorial Church selected as the venue for six classical guitar mini-concerts/ lectures by GuitarSarasota.org. At 7:30pm on the second Monday of the month in our Crocker Memorial Church, November through April, professional musicians from Sarasota/Bradenton, Miami, Tallahassee, and beyond, will perform, educate, and promote the appreciation and cultural significance of the classical guitar as a solo and chamber music instrument. GuitarSarasota’s performances at Crocker Memorial Church are open to the public and free of charge. Seating is open so come early! This series, with its goal to perform and to engage the audience in an enlightening conversation with the artists, is a perfect fit with our Conversations at the Crocker, which is on the second Tuesday of the month. For the schedule of Conversations at the Crocker, see our Events Page. Guitar Sarasota also hosts the 2016-2017 International Classical Guitar Season with four events. Tickets may be purchased for these starting on November 5. Read more. 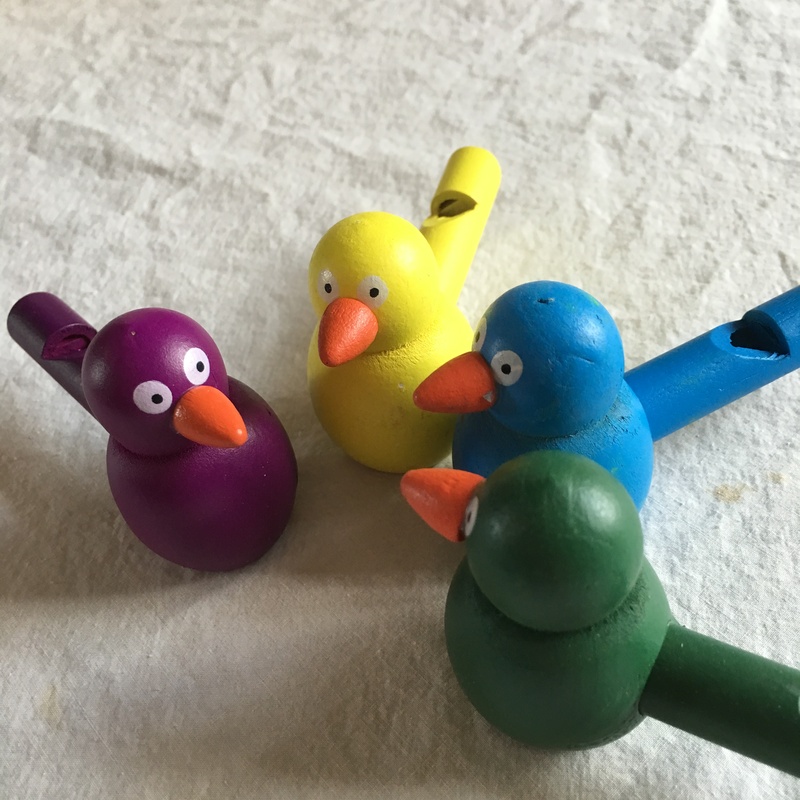 Fun, awards, food and… birds? What did the little birdie say to the other little birdie? Come to the Annual Meeting on May 14 2016 to find out! For the Society’s Annual Meeting on Saturday, May 14, there will be fun, festivities, awards and great food… what else could we want on a beautiful May Saturday? A beautiful, freshly-groomed garden? Check! Voting for the Board of Directors? Check! Delicious pot luck goodies from talented cooks? Of course! Will your smiling face be in this year’s video review of all we did? Come see! Member Peter Piazza puts together a great show for us! Want to hear what we have planned for 2016-2017? Maybe even take part in the planning and execution? Come volunteer? Want to brag on your cooking skills? Bring a dish to share and get ready to taste an incredible variety of yummy stuff. And want to see what A Little Birdie Told Us: The Tree is all about? I think you’re gonna like it. Come discover what we’re talking about on Saturday May 14, 11 am. Sue Padden, the new chair of the Historical Society’s landscape committee, organized a garden beautification day on Saturday, April 30. 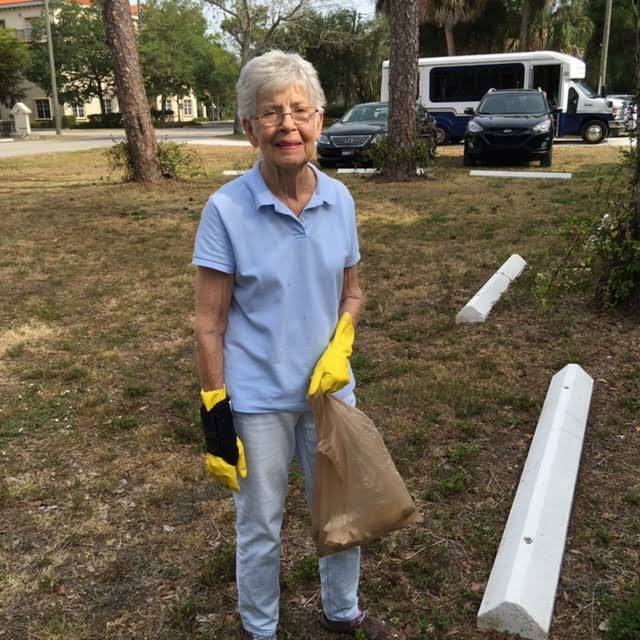 About a dozen volunteers answered her call to weed, prune, rake, plant and spread mulch. Sue is particularly interested in restoring the herb garden. If there’s a call for volunteers, you can be sure Norma Kwenski will show up. She’s here weeding the brick memorial pavilion in front of the Bidwell-Wood House. 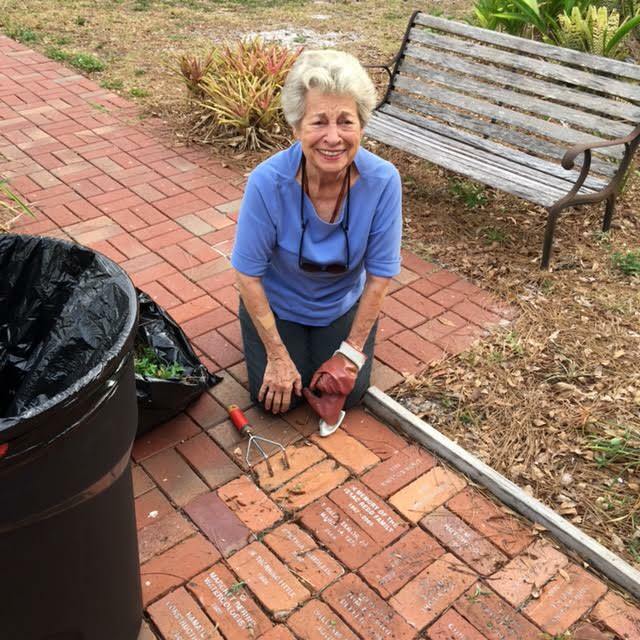 She wants it to look perfect for the annual meeting and potluck luncheon, as well as the brick ceremony where people who have purchased bricks in a loved one’s name will see the bricks installed on May 14. 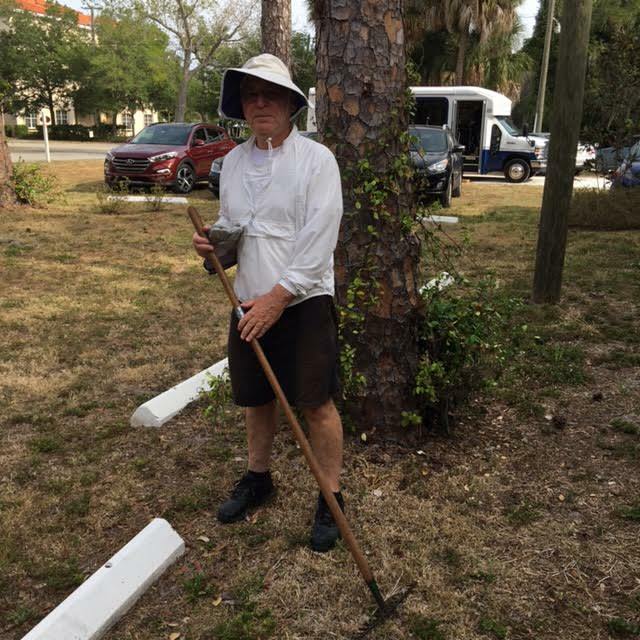 Bob Fottler came dressed for the tasks at hand. He brought several bags of mulch and spread them in the garden in front of the Bidwell-Wood House. The garden can always use mulch and donations are appreciated. 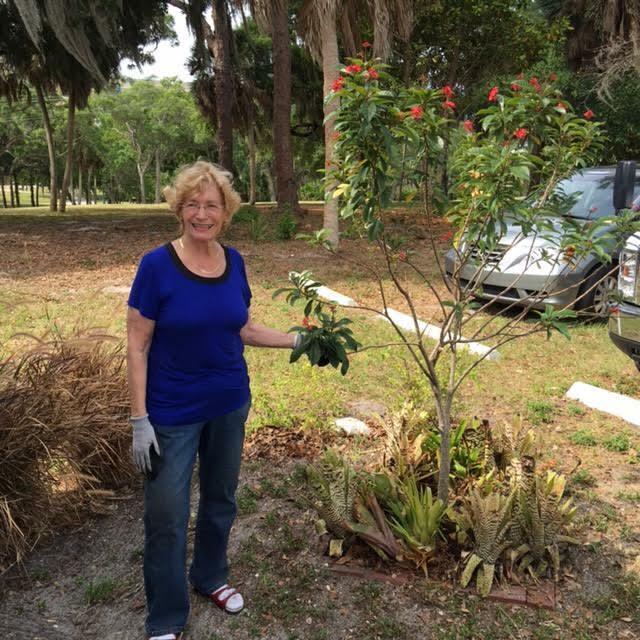 Sara King cleaned out the bromeliad beds on the west side of the Crocker Church and planted new specimens. Lots of weeding and pruning too. 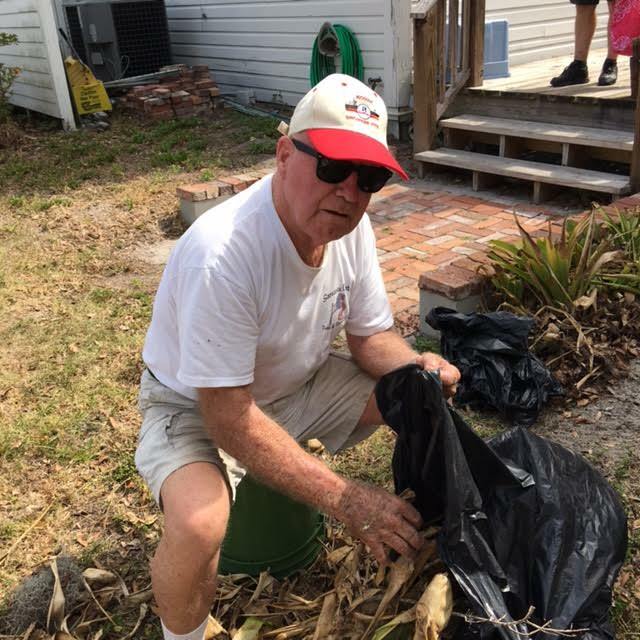 Bill Whetzel, who has maintained the Crocker Cemetery on Bee Ridge Road for 25 years, was on hand for the HSOSC garden beautification day on Saturday, April 30. This man knows a lot about yard maintenance and garden care. 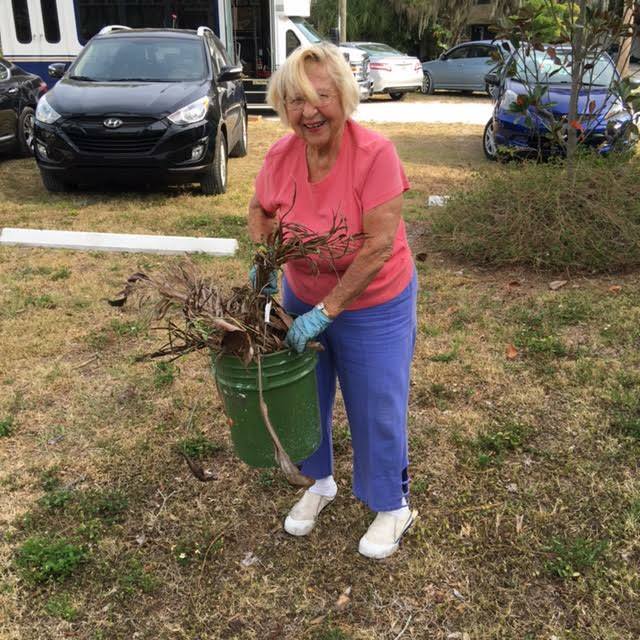 Gwen Whetzel did it all – weeding, pruning, raking, weed pulling. She was an inspiration to everyone. 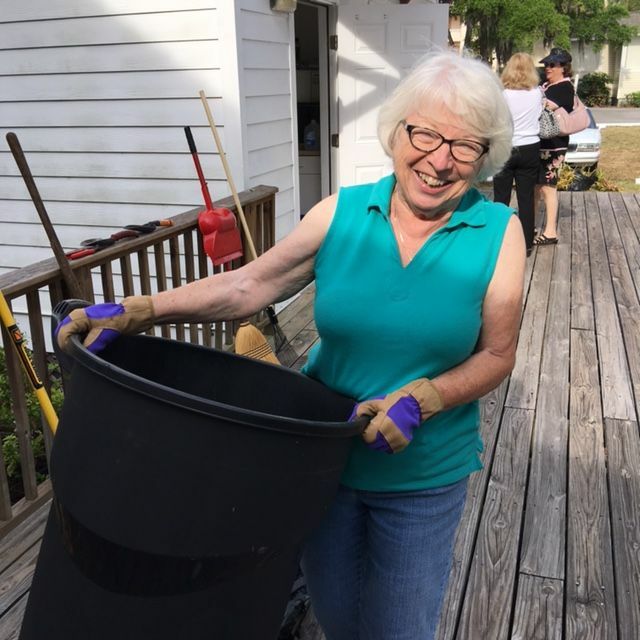 Board member Meade Ferguson has participated in these garden clean up days before, so she knew enough to wear heavy gloves and long pants. All our members thank these hearty volunteers, and look forward to the Annual Meeting coming up on Saturday May 14 at 11am, with Pot Luck Picnic immediately following.